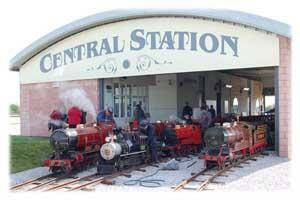 Rhyl Miniature Railway Miniature RailwayBritain's oldest miniature railway - train rides around Marine Lake since 1911. Museum with interactive touch screen, gift shop and toilets. Our railway first opened on 1st May 1911, and has been delighting visitors for over a hundred years! We offer a nostalgia experience suitable for children of all ages. Most of our visitors begin by enjoying a train ride on what is now Britain's oldest miniature line. Our steam trains were built in Rhyl during the 1920s, and so have been hauling passengers around Marine Lake for the last eighty years! Upon returning to ‘Central Station’, find out more about our story in our museum, where there are hands on exhibits to amuse the younger ones. Normally open 10:30 or 11:00 to 14:30 or 16:00. Steam trains Sundays April - September and on some other days - see website. Diesel or electric trains at other times. Standard fares for 2019: £3.00 per adult and £1.50 per child aged 2 to 14. We are located at Marine Lake, behind the promenade at the west end of Rhyl, close to the river crossing (the blue bridge). Look for the white on brown signs from Wellington Road (A548) to find the Marine Lake car park.